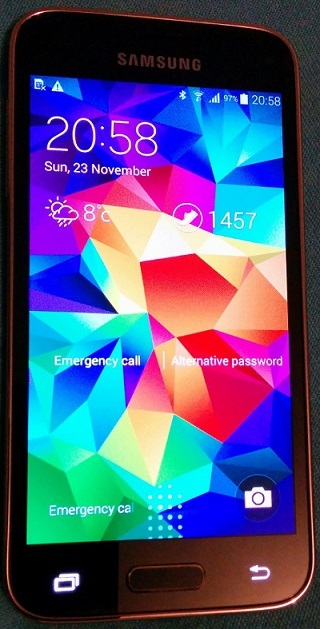 Samsung website selling the Galaxy S5 Mini for £339.95. The special price £229 is only available in Samsung Experience Store at Westfield. If you live in or near London, you can go to the store and get it at that price. You will get 2 year warranty for the handset and 6 months for the battery and accessories. The smartphone features a fingerprint scanner at the home button. Samsung Galaxy S5 Mini is IP67 certified, water and dust resistant. There is a Heart Rate Monitor (HRM) sensor at the back. The back camera is CMOS 8 MP down from 16 MP of the Galaxy S5 and the front camera is 2.1MP. Galaxy S5 Mini packed with a 4.5″ HD Super AMOLED screen, 1.4 GHz Quad-core processor with 1.5 GB RAM. Internal memory is 16 GB and supports upto 64 GB microSD card. There is a 2100 mAh battery to power it up for the whole day. The device is only 9.1mm thick and very light, weights 120g. The S5 Mini has 4G LTE cat 4 and as it comes factory unlocked you can use it any country. The smartphone coming with Android 4.4.2 KitKat. This is an European model. So, you need to make minimum 5 minutes phone call from any European network providers to activate the phone to use worldwide.